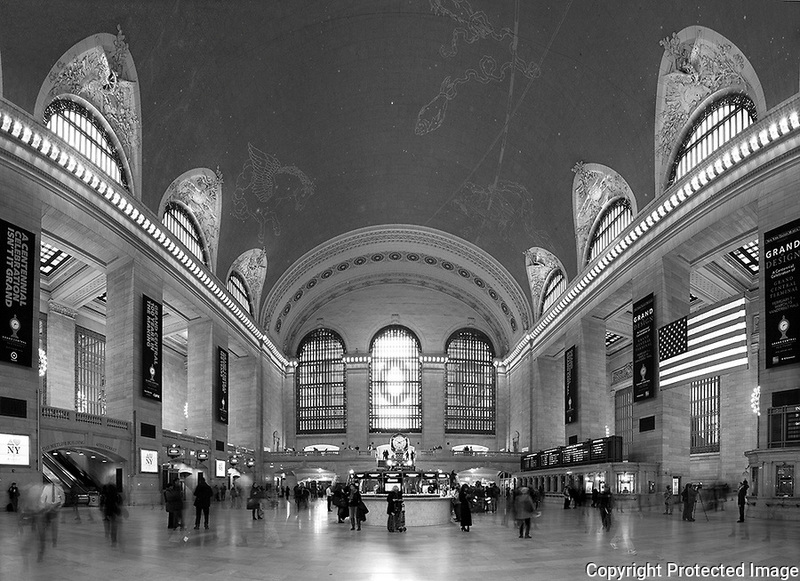 "Hustle n Bustle" Black and White Panoramic Grand Central Terminal Manhattan New York. I was very fortunate to be able to schedule an hour on the main floor of the Terminal during such a special year. It was the 100th Year Anniversary for the building. I wanted to try and capture the light coming through the three windows like in the famous classic old photograph taken when the building was first constructed. When I applied for my photography permit(only one photographer allowed on the floor at a time) I was informed that the light to the windows is blocked by the tall buildings that were added after the Terminal's construction. They did however add the large numbers in the windows to celebrate the 100th Anniversary. I have several photographs that have the ceiling with the constellations in view and the incredible chandeliers that hang in surrounding rooms just off the main floor. I put my camera on the floor and used my remote to fire the shutter to compose the ceiling with the arches of the windows in view. I also have a couple of panoramic photographs that have transparent travelers in motion moving through and cover the entire width of the main floor.